GM Catenary is a single line 2D catenary analysis software designed for analysis of moorings or towing lines. The software has been developed for the marine marketplace where mooring and towing operations are proposed. GM Catenary is a useful toolkit for surveyors and others responsible for anchor running and towing operations. GM Catenary is an invaluable tool on tugs, anchor handling and all spread-moored vessels, where it supports mooring analysis and provides quick, efficient and detailed results of catenary line problems when addressing pay-out and clearance issues. Mooring line entanglement with subsea assets is a costly business in terms of asset integrity and pollution risks. This software provides instant assurance of clearance issues associated with mooring lines that cross subsea assets. Proposed changes in mooring line makeup are easily accommodated and various changes can be readily compared. Clearances from known subsea assets are tabulated for ease of reference. 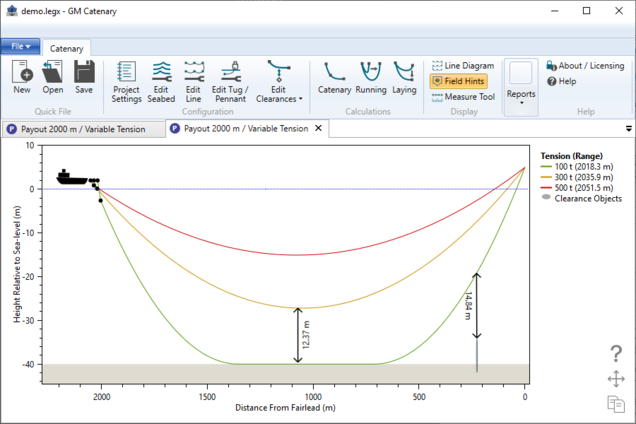 In addition, catenary line properties can be assessed on range, pay-out or tension properties. The software accommodates touchdown of mooring lines for accurate representation of clearance issues. It also accommodates mooring line development while running anchors, in that the anchor can be at the stern of an anchor handling vessel or on a length of pennant. In addition, the programme addresses tow-line dip for tow operations, which is particularly important when tow operations are being conducted in shallow water. By simple mouse placement, clearance issues of a mooring line at any point along its length can show distance from the anchor fairlead, distance from the anchor, and height of the mooring line above the seabed, or below the sea surface. This is useful in assessing draft available alongside a moored vessel during supply type operations. GM Catenary is sold as a one off download per user for unlimited use. The software is fully supported by a robust support team, who is on hand to assist with any questions.